Back when I launched #BSFIC I drew the cartoon for the challenge badge, featuring a scoop of green ice cream, drizzled with chocolate and served in a waffle cone. I’ve never been a good artist so I was rather pleased with my efforts! Since then, it’s presided over more than 14 challenges. When I set May’s challenge as edible Cones & Cups, Biscuits & Baskets, Wafers & Waffles – in short, edible ice cream containers – I knew I wanted to try and recreate my little sketch in real life. 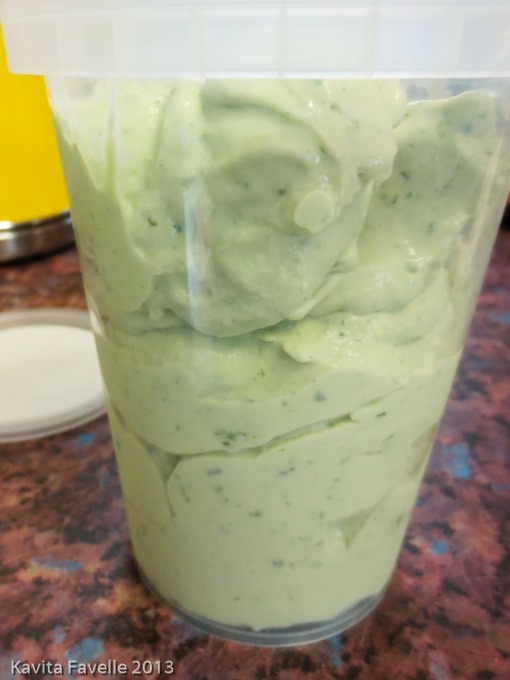 For the green ice cream, I considered matcha, avocado, pistachio, and several herbs including mint and rosemary but in the end, settled on basil (recipe below), an ice cream flavour I first encountered on holiday in Islay in 2006. 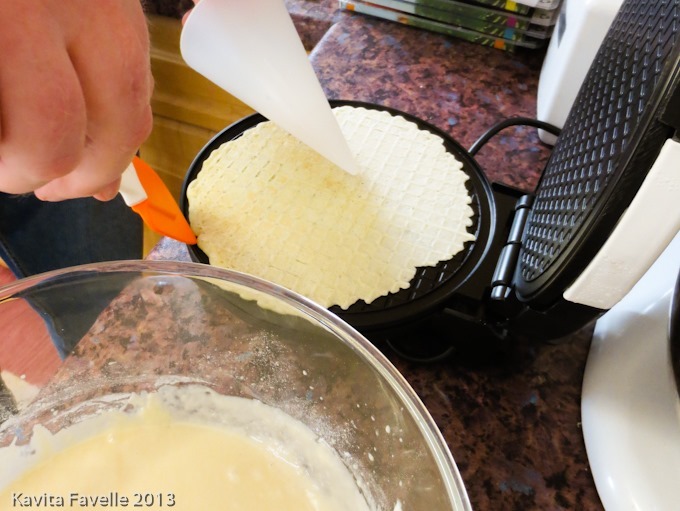 Lakeland stepped in to send me a review sample of their Waffle Cone Maker (and are kindly giving away a second one as a prize for the best entry to this month’s challenge). 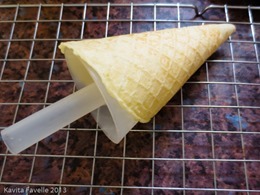 Pete did all the work creating the cones, which was fairly straightforward but slower than we’d anticipated. 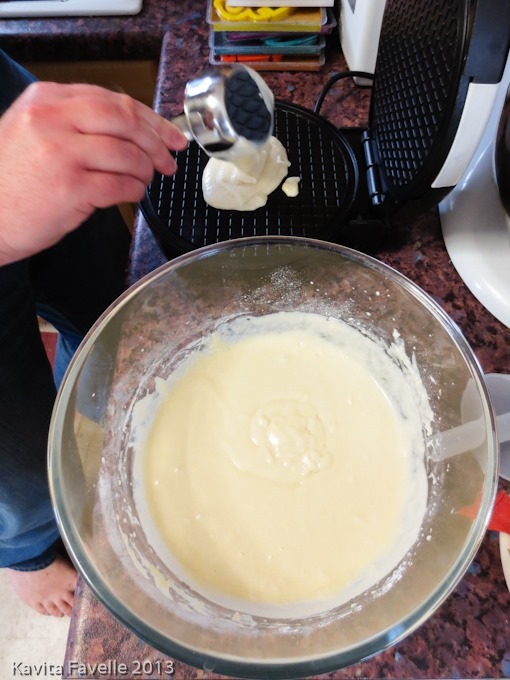 He made the batter according to the recipe in the instructions booklet and got to work. 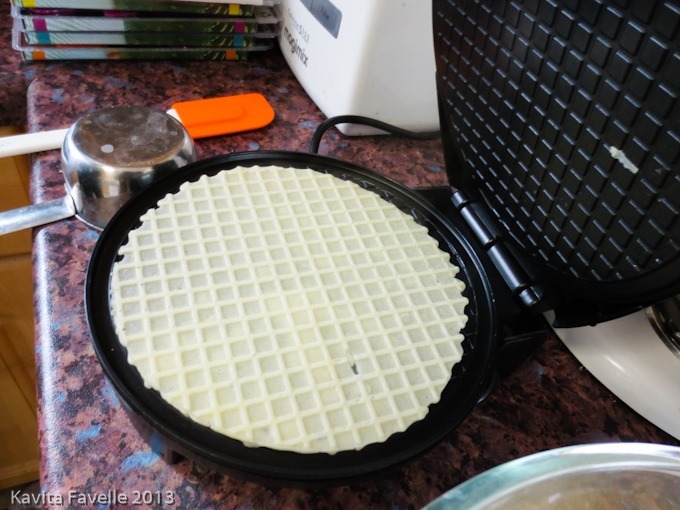 After preheating the waffle cone maker, he poured some of the thick batter onto the lower plate, closed the lid and waited for the waffle to cook. We had the temperature set to its highest, but it was still slow. Each waffle took about 5 minutes to cook through – twice the 2-3 minutes instructed. As soon as they had a little colour, Pete used the plastic mould provided to form the pliable waffles into cones before they cooled and hardened. 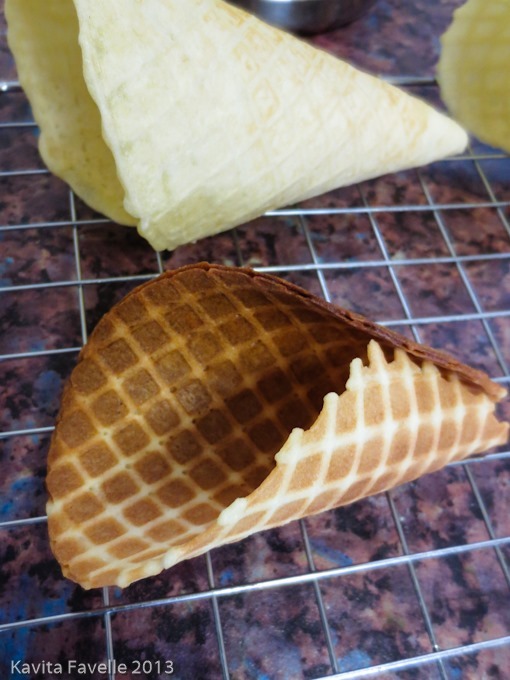 When we tried to give them a little more colour, they hardened too fast for Pete to wrap them around the cone, which is a shame as I thought the darker ones prettiest. 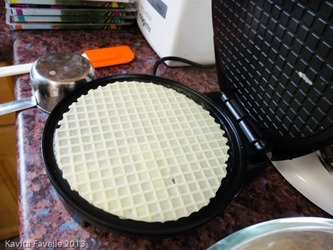 A couple weren’t cooked enough and never hardened, but we found we could put them back into the waffle cone maker and cook them a little more. A hint of brown was the best compromise between appearance and being able to form cones easily. 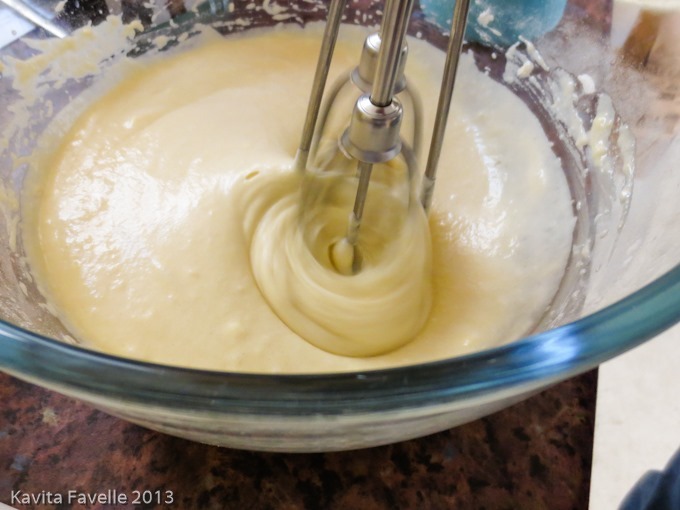 Regular readers of Kavey Eats will know that I am not one to insist that everything always has to be from scratch. 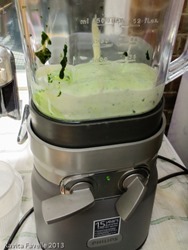 Instead of making custard, and steeping the basil in it as it cooked, I used a good quality fresh ready made custard and added fresh basil, blitzed with a little sugar to help it grind more easily. The flavour of the basil came through clearly and the touch of extra sweetness from the sugar was welcome too – when making custard for ice cream, I make it a touch sweeter than for serving warm, as flavours are always muted a touch by freezing. 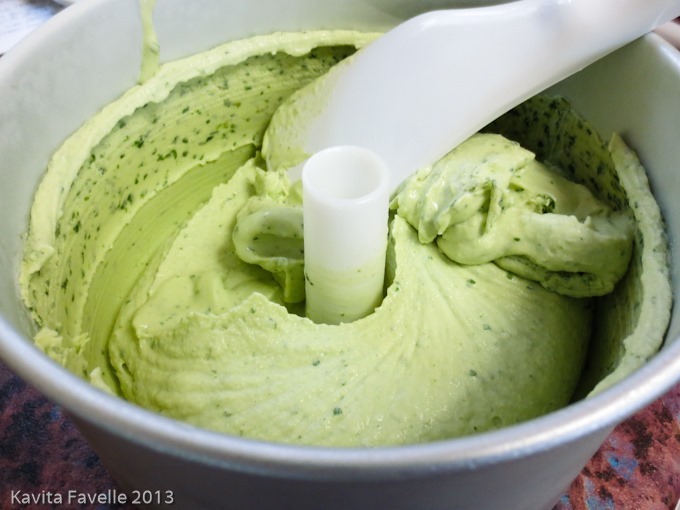 This is a lovely, summery ice cream and a nice alternative to fresh mint. 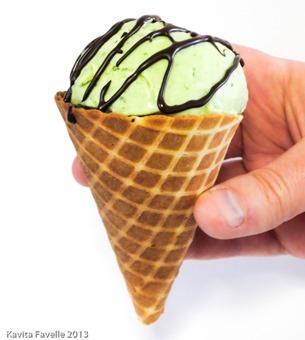 Note: This ice cream freezes very solid. Add a tablespoon or two of vodka to make it softer after freezing. 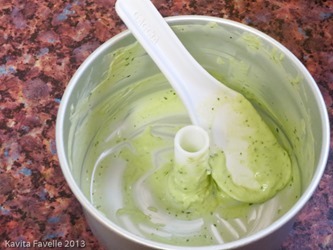 Process the basil leaves and sugar together to form a paste. 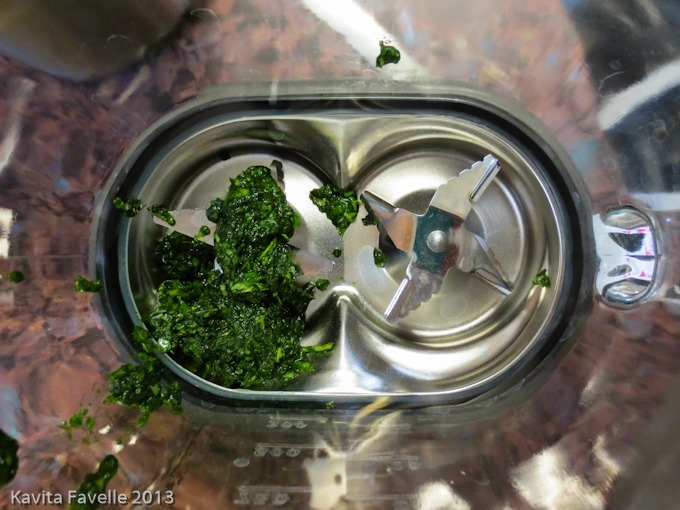 I used my Cuisinart Spice and & Nut Grinder for this. In a blender, combine the custard and the basil paste and blitz until smooth. Pour into your ice cream maker, and churn according to the instructions. Finally, it was time to assemble my homage to the #BSFIC drawing. 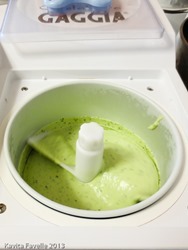 Pete came to my rescue in carving out a nice round scoop from the very solid ice cream. 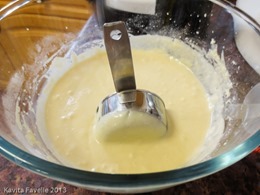 (Next time I’ll add a tablespoon of vodka to the mix before churning, to give it a little softness once frozen). We chose the darkest waffle cone, as it was the best match to my cartoon cone. I melted a few squares of Divine 85% dark chocolate in the microwave and drizzled it over the ice cream. My only regret is not posing it in front of Pete’s maroon T-shirt instead of our white card backdrop for an even better match! 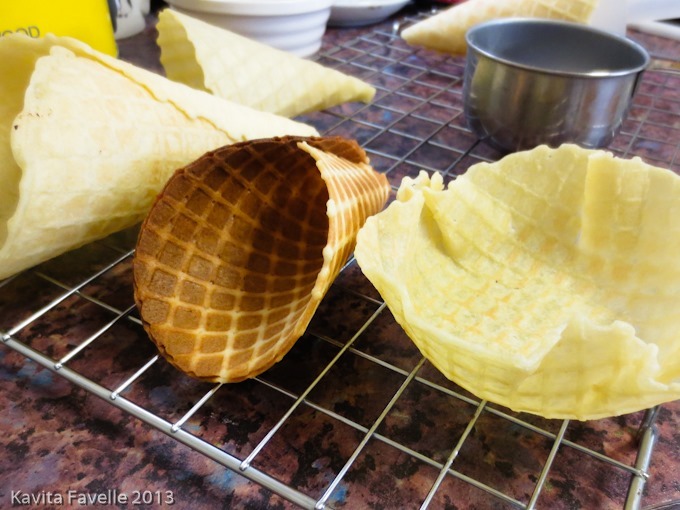 If you’re thinking about taking part in Bloggers Scream For Ice Cream, the theme this month is edible Cones & Cups, Biscuits & Baskets, Wafers & Waffles and all bloggers from anywhere in the world are welcome to enter! 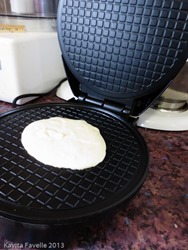 Don’t forget there’s a prize for best entry this month – Lakeland have given me a second waffle cone maker to give away. (T&C on the challenge page, above). 13 Comments to "When Cartoons Turn Real: Basil Ice Cream, Waffle Cone & Chocolate Drizzle"
Ha! That’s ace – it looks co much like the illustration. 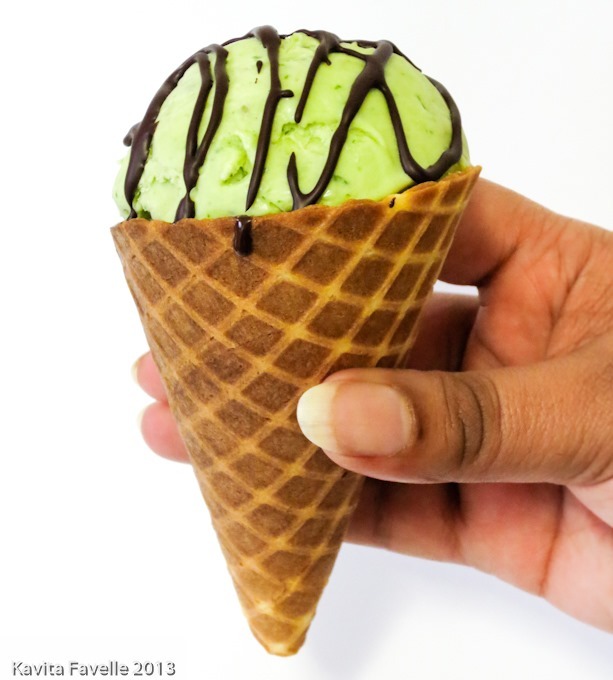 Its remind my childhood days when I used to have ice-cream with my sis. Would like to rewind my days with my sis. Thanks for confronting my cherries movement. I don’t know what your cherries movement is, to be honest…? Thanks, I’m so pleased how close we got it! I’m so impressed that you make your own cones! Kudos! I really like it very much! You’ll have to try it. 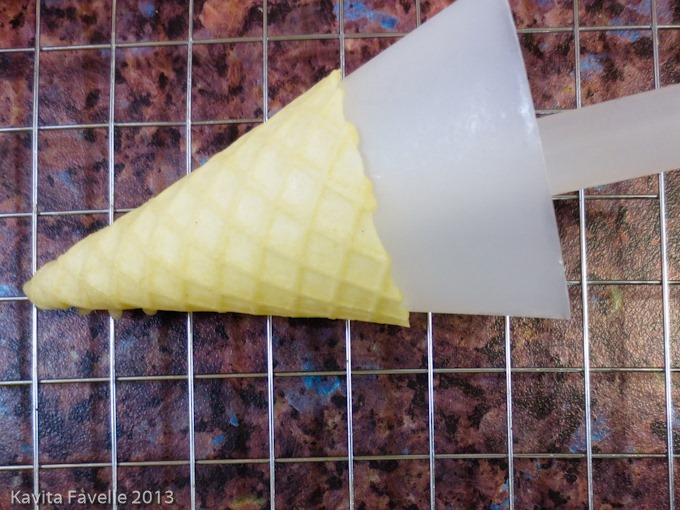 And Pete gets the cone kudos, really! I just hung around and watched!! I was worried the colour wouldn’t be green enough, but I didn’t want to add more basil as this was a good balance – strong flavour but not too metallic or bitter, as basil can be when too much is used. It came out just as I hoped! 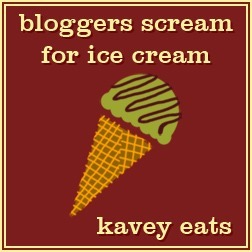 Love it Kavey what a great idea!